Surely one of the world’s most beautiful natural locations, Huangshan (Yellow Mountain) is an incredible place to visit and it’s a joy to hike and photograph along its numerous well maintained pathways. This photo features a temple at the bottom of the mountain, right near the car park. I made the photo moments before leaving the area after spending an amazing three days photographing and hiking across the various peaks that are commonly referred to as Huangshan. 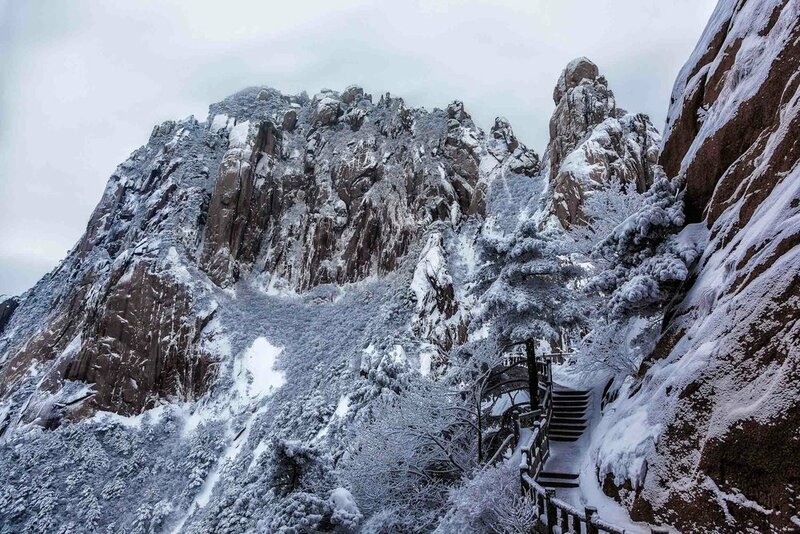 A delicate image on the top of a snow covered ridge on Huangshan (i.e., Yellow Mountain) in East China. I visited either side of my birthday in late January which, as you can see, is the middle of winter in China. It’s very different weather to what I’d normally be experiencing back in Melbourne where I currently reside. As is the case with many famous landscape locations Huangshan receives literally millions of tourists every year. That makes tripod based photography from steep and narrow mountain pathways problematic. It was the lack of crowds and the ability to set up my tripod without causing any trouble to other tourists that was behind my decision to visit Yellow Mountain very much off season. The color yellow signifies happiness in Chinese culture. I plan to return and, while it makes sense to explore Huangshan at a different time of year, I’m not against another winter visit. As in all things, time will tell. Three of the hardest and most beautiful days of my life were spent walking the paths of Huangshan (i.e., Yellow Mountain) in China during the middle of winter. There’s plenty of texture in this photo which, in my workflow, usually marks it as a potential candidate for rendering into black and white. However, in this case, I liked the muted, understated colors within the scene and decided they were worth exploring. A little bit of a tickle on the desktop moved the color palette towards a more sombre, vintage look. And I think that very much suits the mood I felt when leaving this most beautiful place. I can’t wait for my next Huangshan adventure. While it would be great to visit any time of year I can testify that, without the crowds, exploring Yellow Mountain during winter is great fun. If you’re in Melbourne, Australia and planning a winter holiday you should consider hooking up with me for a private photography class. If you’re interested feel free to contact me directly to discuss the options.